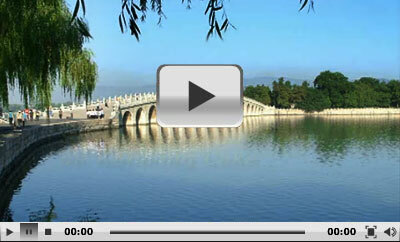 Situated in the Haidian District northwest of Beijing, Summer Palace is 15 kilometers (9 miles) from the downtown area. Being the largest and most well-preserved royal park in China, it greatly influences Chinese horticulture and landscape with its famous natural views and cultural interests, which also has long been recognized as 'The Museum of Royal Gardens'. Yiheyuan radiates fully the natural beauty and the grandeur of royal gardens. Composed mainly of Longevity Hill and Kunming Lake, it owns over 3,000 man-made ancient structures, including pavilions, towers, bridges, corridors, etc. In 1750, the construction of the lavish royal garden started to prepare for the birthday ceremony of Emperor Qianlong’s mother, with the original name being 'Qingyi Garden' (Garden of Clear Ripples). In 1869, like most of the gardens in Beijing, the Summer Palace could not elude the rampages of the Anglo-French Allied Force and was destroyed by fire. In 1888, the garden was reconstructed and renamed as the Summer Palace (Yiheyuan). It was recorded that Empress Dowager Cixi embezzled navy funds to reconstruct it as a resort where to spend the rest of her life. In 1900, Yiheyuan suffered another hit by the Eight-Power Allied Force and was repaired in the next two years. In 1914, it was open to the public. In 1998, the Summer Palace ranked amongst the World Heritage Sites by UNESCO, as well as one of the first national AAAAA tourist spots in China. The Summer Palace can be divided into four parts: the Court Area, Front and Rear Area of Longevity Hill, and Kunming Lake Area. It is located in the northeast of the Summer Palace, and it spreads from East Palace Gate to the northeast coast of Kunming Lake. This was a substitute where Empress Dowager Cixi and Emperor Guangxu met officials and conducted state affairs. With the same pattern of the imperial palace of China-'Palace in front and garden behind', the Court Area consists of sections for both court affairs and living. East Palace Gate and Hall of Benevolence and Longevity served as office of the Emperor. The Hall of Jade Ripples was for Guangxu to live in and the Hall of Joyful Longevity for Cixi. There are also the Garden of Virtue and Harmony where Cixi was entertained and Yiyun Hall where once lived the Empress Longyu. Moreover, this area is an integrated transport hub and the first best stop for visitors to enjoy attractive view of Kunming Lake and Longevity Hill. This is the most magnificent area with the most constructions. It is symmetrically laid out in east and west many delicate buildings and graceful gardens with the south-facing Tower of Buddhist Incense as the central axis. Walking up to the hilltop, on which lots of important buildings are positioned, including Hall of Dispelling Clouds, Hall of Moral Glory, Baoyun Bronze Pavilion, Revolving Archives, Hall of the Sea of Wisdom, etc. The area covers a larger part, and opens up the vista of Kunming Lake, as well as the sights around Back Lake (Houxi River). East Causeway of the lake is connected to the West Causeway by Long Gallery, which both were interspersed with pavilions, bridges and wharfs. Famous attractions amongst this area are numerous, including Seventeen-Arch Bridge, Bronze Ox, Nanhu Island, Hall of Embracing the Universe, Spacious Pavilion, Pavilion of Bright Scenery, Marble Boat, Suzhou Market Street, etc. As breeze fluttering, waves gleam and willows kiss the ripples of the vast water, the highlights can't be let off from any of the delightful scenery above. It is quiet as compared to Front Hill Area in Summer Palace. Most constructions were never able to be repaired after wars, only a few ruins are left. In the axis of Rear Hill Area, there used to be a religious building group-Houda Temple, a composite structure with both Han and Tibetan characters. Although the constructions are fewer here, it has a unique landscape with dense green trees and winding paths. Strolling here, visitors can feel a rare tranquility and elegance. Famous scenic spots include Garden of Harmonious Interests, Hall of Increasing Longevity, Four Great Regions, Presence of Virtue Temple and Hall of Serenity, etc. To the East Palace Gate: Take bus 303, 331, 332, 346, 508, 579, or 584, and then get off at Yiheyuan Station; or take bus 384, 394, 563, 594 or 601 to Poshangcun. After that, walk west for about 200 meters (220 yards) to the gate. To the West Gate: Take bus 469 or 539 and get off at Yiheyuan Ximen (Yiheyuan West Gate) Station. To the North Palace Gate: Take bus 303, 331, 346, 394, 563, 584, 594 or Singtseeing Bus Line 3, and get off at Yiheyuan Beigongmen (North Palace Gate) Station; or take bus 332, 384, or 601 to Beigongmen Subway Station. To the New Palace Gate: Take bus 74, 374, or 437, and get off at Xin Jian Gong Men (Yiheyuan New Palace Gate) Station. 1. Take line 4 to Beigongmen, and exit from D. After that, walk west for 3 minutes to the North Palace Gate. 2. Take line 10 to Bagou Station. Then take Western Suburban Line to Yiheyuanximen Station. Walk north for 4 minutes to the West Gate of Summer Palace. 3. Take line 4 or line 16 to Xiyuan and leave from exit C2. Walk west for about 15 minutes to the East Palace Gate. Note: Free for children under 1.2 meters (3.9 feet). Hello, which is the best area to visit first- East gate, North gate, West gate of Summer Palace? In addition, the duration is around 3 hours. Is the Summer Palace crowded on a Sunday (non public holidays period - April)? Is it recommended to visit the place on a weekday or weekend? Yes, Eileen, generally speaking, there will have more tourists on weekends. Thus you are advised to tour around there on a weekday. which subway is the closest to Beijing jingshan park exit and how to get there? As I know, the near one is Nanluo Guxiang Station on subway line 6. From the park, you can walk northeast around 1km to find this station. Summer Palace, Forbidden City and Temple of Heaven provides wheelchairs. Oh, I see. If so, don't worry. It is possible to be there with wheel chair or baby stroller. We are planning on visiting the Summer Palace before our 12:4pm flight, so we figure we need to leave around 10:30am to get to PEK by 11:30. So we want an early start. I read that the complex opens at 6:30am but the "scenic spots" open at 8:30am. But I can't figure out what the scenic spots are? What would we be able to do/see between 6:30am and 8:30am? The scenic spots are Wenchang Hall, Dehe Garden, Tower of Buddhist Incense and Suzhou Street. Thus you can see the other spots between 06:30am and 08:30am.